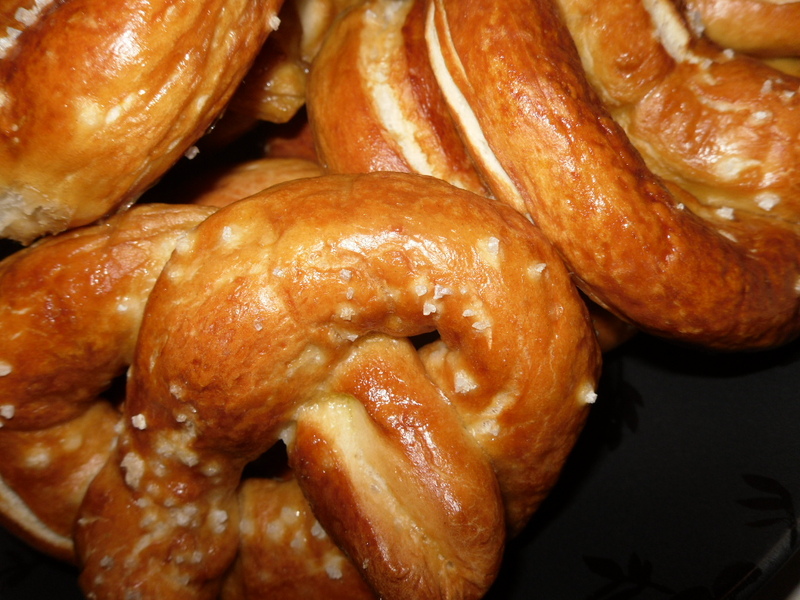 Bust out the beer and mustard, it’s pretzel time! Prost! I can’t believe it took me this long to make these. It’s been on my to do list forever. Finally, here they are! My husband even enjoyed these and he’s not a pretzel fan really. Proof your yeast. Remember, from my bread post? Well, if not, place your yeast in your stand mixer’s bowl. Add warm water and honey. Combine by lightly swishing it around and leave it for 5 minutes. If you have foam on top after five minutes your yeast is alive and kicking and you can proceed with the recipe. Next add the butter and salt. Add half the flour and begin mixing with your dough hook attachment on low. 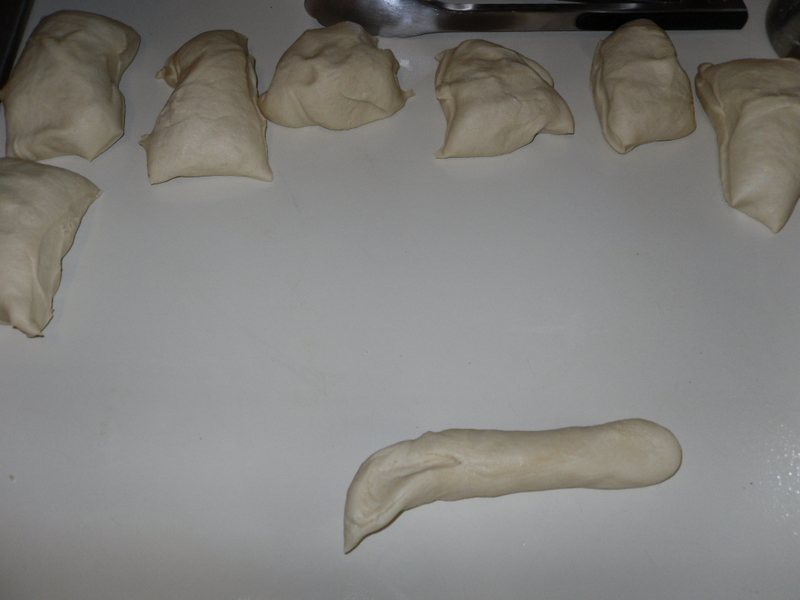 Continue to add flour until the dough has formed a nice ball and is not sticky to the touch. Let the mixer knead the dough for you on medium for 8 minutes. This builds up the gluten giving the pretzel its nice chewy texture. 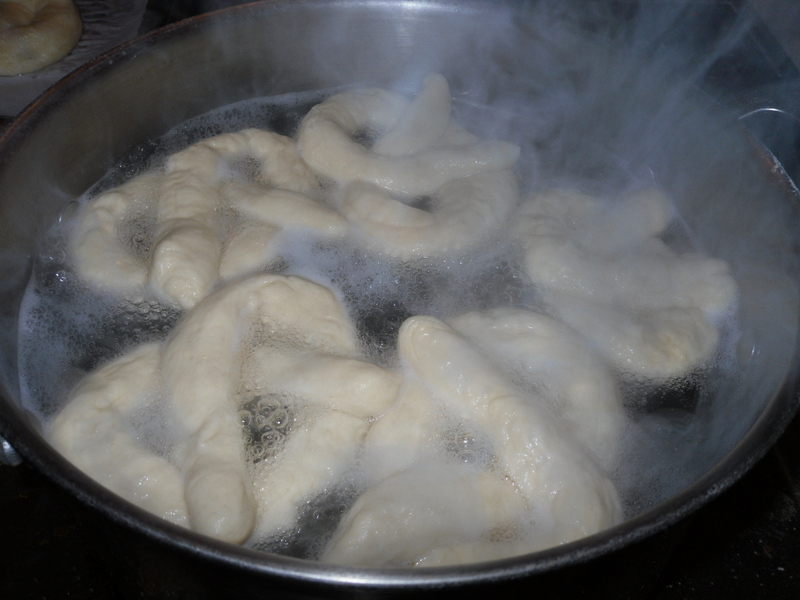 Remove the dough from the bowl, spray the bottom of the bowl with cooking spray. Replace the dough and spray the dough as well. Cover and place in a warm area for 45 minutes. Separate your newly risen dough into 16 balls. 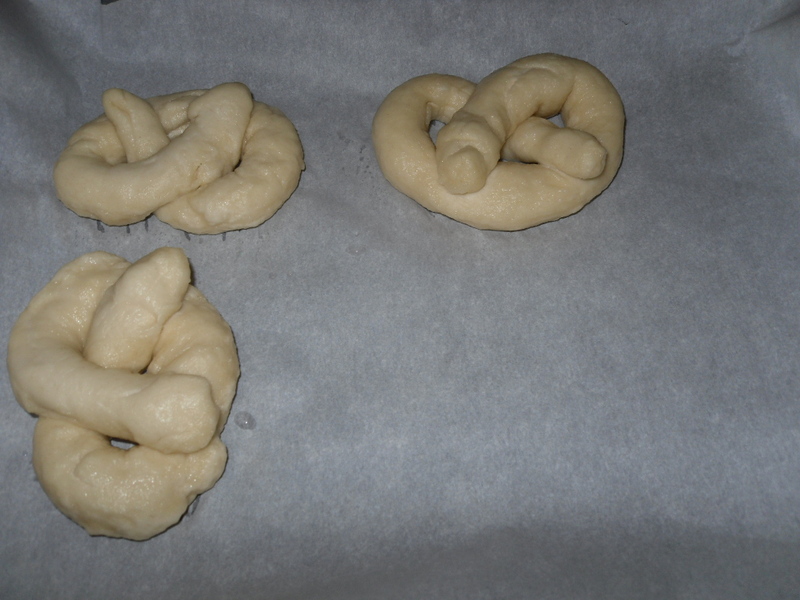 Make a rope by rolling on a clean counter, get them uniform in thickness and form your pretzel shape. Preheat your oven to 450 degrees and put your water on to boil. Fill your largest pot ½ to ¾ full of water and add the baking soda. 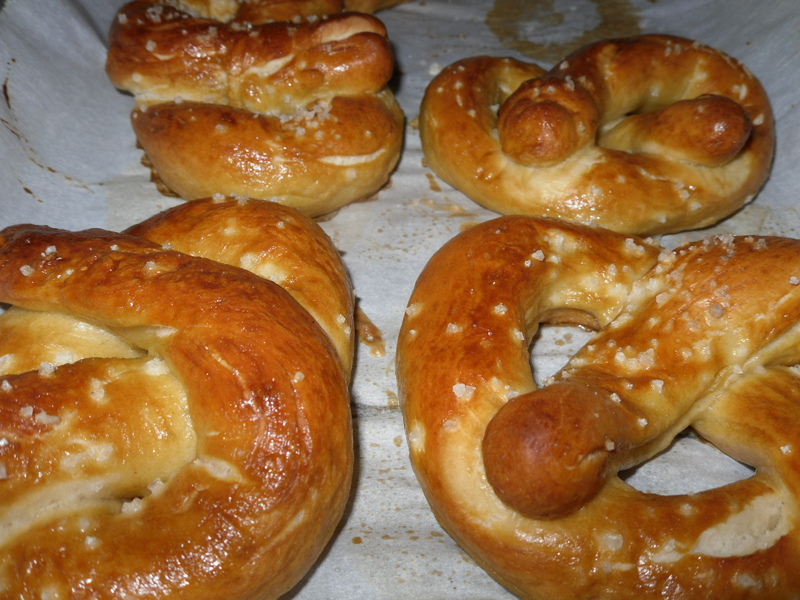 Boil each formed pretzel for 30 seconds and place on a cookie sheet lined with parchment. Brush with egg and water mixture and sprinkle with coarse salt. Bake pretzels for 12 minutes. When the pretzels are nice and brown they’re done. 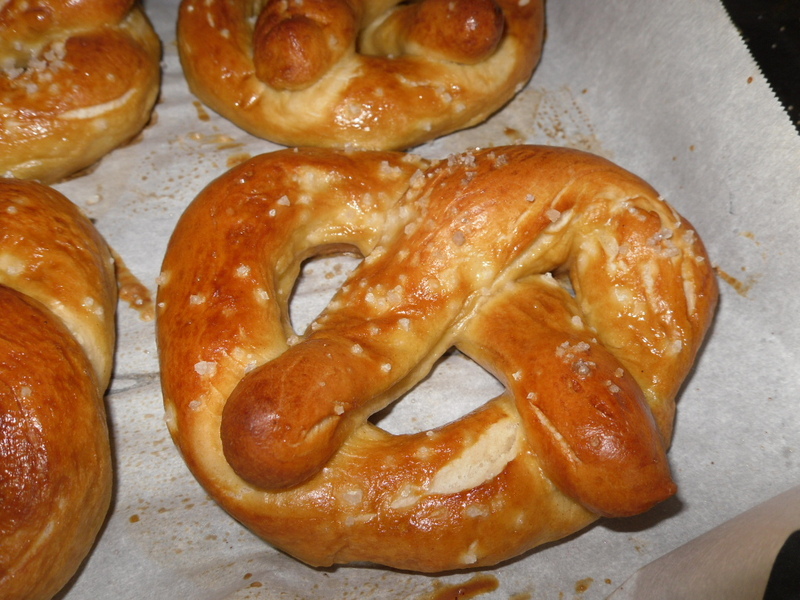 Don’t over bake or you’ll have hard pretzels! I also love the Oxford comma. Oh my goodness. I quite possibly shouldn’t have seen this. I’m 26 weeks pregnant and I love salty food, and pretzels are awesome. I think I might have to sneak away to try this recipe. 😉 Looks wonderful! These look way better then the ones I made. Perhaps I should try your recipe. Give it a try and come back and tell me how they turned out. These are so good! Love this. I am going to try this. Thanks for sharing this recipe.